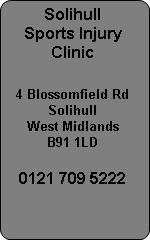 Solihull Sports Injury Clinic in the West Midlands see many cases of overpronation and use prescription orthotics for correcting poor foot biomechanics. Our Sports Podiatrist can assess you and offer advice following a biomechanical assessment. Flat feet, pronated ankles, pronated feet, and dropped arches are all terms used to describe overpronation. As you can see from the photographs the feet roll inwards flattening the arches of the foot and putting stress on the ankle and foot. Pronation is a natural movement of the foot and its overpronation that is the fault. Overpronation can cause many sports injuries including shinsplints, knee pain and achilles tendonitis. Overpronation is something that can be a problem for long distance runners like marathon runners. Anything longer than 10k races will give you injury problems if you have poor biomechanics and overpronation. Overpronating feet or ankles will result in all kinds of additional stresses put on knees and ankles and ofen have an impact on your back pain too. Atlas orthotics are designed to correct your overpronating feet and help prevent injuries, especially running injuries.